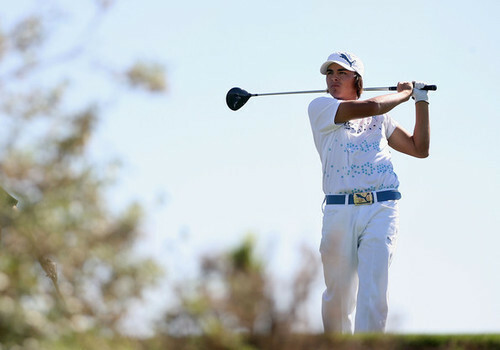 Rickie Fowler: The Real Deal? With all the young talent out there, we’re constantly talking about and searching for golf’s next big thing (otherwise known as the next closest thing to Tiger). Forget Anthony Kim, Camilo Villegas and Adam Scott — they’re yesterday’s news. Now, it’s about Rory McIlroy, Ryo Ishikawa and Danny Lee. Add another to that list: Rickie Fowler, the 20-year-old All-American Oklahoma State standout, who only turned pro in September. So far, this kid is living up to the hype (surprise!). Last week at the Justin Timberlake Shriners Hospitals for Children Open (God, that’s a mouthful), he made his first start on the PGA Tour as a professional. And while we know he’s good, he surpassed many expectations, finishing T7. But then could he continue his hot streak at this week’s Frys.com Open? Oh, yes. Rickie fired rounds of 65-64 for a two-day total of 11-under, and going into the weekend he’s at the very top of the leaderboard. He only missed two greens in two rounds (both on Friday). Oh, and, the Golf Channel can’t stop the Rickie-fawning — the commentators are drooling over him. Or, they’re just thinking: Thank God, he’s playing so well. Now we have something to talk about other than Chad Campbell’s niceness and pretending we think the Fall Series is tremendously thrilling. Then, there’s the question of Q-school. For Rickie to bypass it and secure his card for next year, he needs to finish in the top 125 on the money list. With the $113,700 check from last week, he would either need to win or place second to do that. It’s too bad he had to wait until after September’s Walker Cup to turn pro, otherwise he likely would have cashed more than enough. If he does pull off the near impossible this weekend, he would be the first player since Ryan Moore to dodge Q-school. My expectations were basically just to go out and have two fun weeks and play as well as I could…There’s no reason to tee it up in a tournament if I don’t think I can win. Last week I put together some solid rounds and put myself in contention. This week, feel like I’m in a great spot going into the weekend…Right now [going to Q-school] is still the plan. Considering Rickie’s fearless, chill attitude, he’s got what it takes to handle the limelight, the pressure and the intensity. That said, he might actually pull off the unthinkable this weekend, and you know, win. Believe it? TBD Sunday.